This page lists our upcoming and past events. Check back regularly for updates! For information on any of these events, please contact us. Thank you everyone for embracing community spirit! Bathorium's Main Street Day raised an incredible $6720 in 24 hours!!! ​to sign up for your reminder! Main Street Community Services Presents…. Our Little Caesars® Pizza Kit Fundraiser! It’s Pizza! time! Time for you, your friends, and your family to get your Little Caesars® Pizza Kits! Have them on hand for quick dinners, parties or entertaining! Buy several Kits and stock your freezers! ​for all the exciting details! Because of your generous donations and participation, we raised $3,212.24!!!!! There are a number of organizations and individuals who's charitable donations and exceptional efforts played an instrumental role in the days success. We would like to extend a special thanks to Irish Hills for hosting us, and Hurley's for preparing an amazing dinner and providing the "grab bags" available at the tournament, and the fridge we raffled off. We would also like to thank Melanie St-Pierre for her phenomenal efforts organizing the donations for our silent auction! ​As you may have heard at the dinner from Shelley Steinburg – we have officially signed for our new Centre located in Kanata. We are elated to finally see our dream of having “a place of our own” come to fruition, and your contributions are going directly to this expansion. The ongoing dedication and commitment of our staff team has allowed this organization to not only excel, but set the standard of care in our field. We could not have done it without each and every one of you, and are looking forward to seeing what this new chapter has in store for us. We would like to recognize and sincerely thank the Ultramar Service Station on Hazeldean Road in Stittsville for their generous donation of $5,000. This donation will be used to purchase electronic devices, sensory toys, and other items for our day program. Electronic devices are a tool that benefits individuals with disabilities as they offer interactive programs to help them gain more knowledge in various academic areas; to assist them with improving their communication skills; improve their functional living skills by learning how to research different topics, such as bus routes and recipes; and to assist them with self-regulating their anxiety and emotions. The donation is extremely appreciated and will benefit many individuals in need and help improve the services we provide to the community. Main Street Community Services would like to thank the Stittsville Food Bank for their ongoing donations. We are grateful for your generosity! On May 28th-29th, Main Street Community Services participated in the Tamarack Ottawa Race Weekend. Thank you to all those who participated in an event and braved the heat! Thank you to all those who came out to watch the participants and who sponsored a runner or made a donation. Your kindness is invaluable! Thank you to all of the volunteers who sold 50/50 tickets at the Ottawa Senators games this season. Thank you to Darlene MacDonald for all of her efforts. Your support is greatly appreciated! Thank you to Starbucks in Kanata Centrum for organizing a coffee house on our behalf. There was live music, delicious tasting samples, and raffle prizes! Thanks to everyone who came out to support this event and who helped make this event a success! We would also like to thank the Giant Tiger in Stittsville for their support with our Angel Tree. A big thank you also goes to members of the community who chose an angel off the tree to buy a present for a special individual this holiday season. We are extremely grateful and appreciative of all the different types of donations we have received to ensure all the individuals we support have a Christmas to remember. Thank you for your generosity! Thank you to Hurley's Bar & Grill in Stittsville for hosting another successful fundraiser on March 31st, 2017 on behalf of Main Street Community Services! Thank you everyone who came out to support this fundraiser, purchased 50/50 tickets, and provided donations. Your ongoing generosity is extremely appreciated! 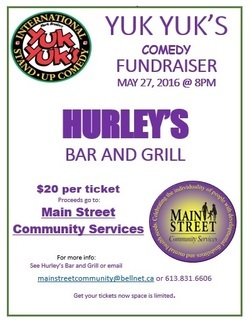 On May 27th, 2016, Hurley's Bar & Grill in Stittsville hosted another successful comedy fundraiser on behalf of Main Street Community Services. We are grateful to all those who attended the event, which provided lots of laughter and delicious food and drinks. Thank you to Hurley's Bar & Grill and to the community for their ongoing support and kindness! 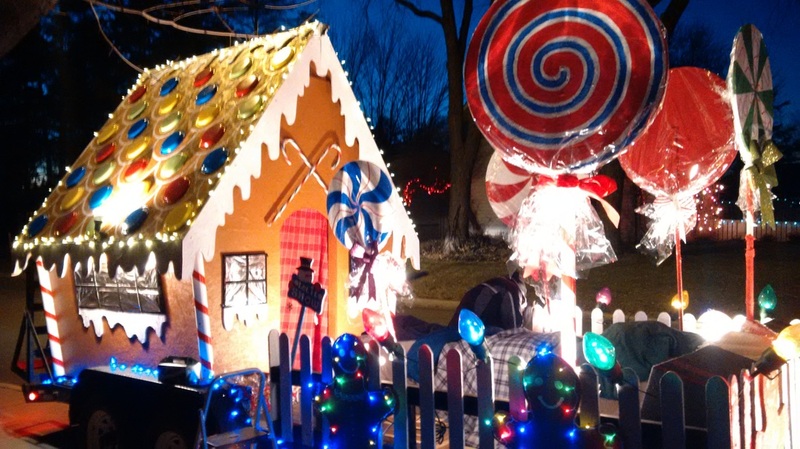 Every year the Stittsville Village Association organizes the Parade of Lights for the Stittsville community. Main Street Community Services proudly enters a float annually to celebrate the holiday season. We would like to thank Scott and Emily Carruthers for all of their efforts in putting together a beautiful float for Main Street Community Services! We hope to see you at the parade next year! We would like to thank Hurley's Bar and Grill Stittsville for hosting another Yuk Yuk's Comedy Fundraiser to support Main Street Community Services. The audience was treated to live music performed by Jumpin' Jimmy Leroux, followed by a lot of laughter and entertainment provided by Tim Rabnett, our Host for the evening, Heather Hurst and Mark Hatfield, the Opening Acts, and Derek Sequin, the Headliner! A big thank you goes to everyone who attended the event, made a donation, purchased 50/50 tickets, and volunteered their time to make this a sold-out event. Your support is greatly appreciated! Main Street Community Services, in partnership with Hurley's Bar and Grill Stittsville and Irish Hills Golf and Country Club, hosted a Charity Golf Tournament on September 19th, 2015. Participants enjoyed 9 holes of golf as well as a steak dinner at Hurley's Bar and Grill. Proceeds from the event will be used to support Main Street Community Services. We would like to thank Hurley's Bar and Grill Stittsville and Irish Hills Golf and Country Club. We would also like to thank all those who participated in the golf tournament, helped organize the event, and who made a donation. All of your efforts and support made this a wonderful event! 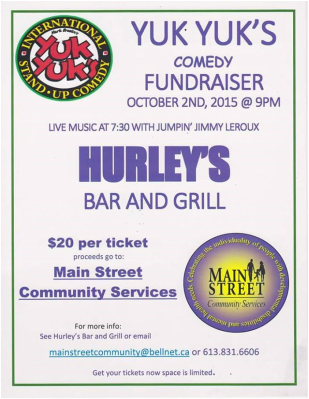 We are very grateful to Hurley's Bar and Grill who hosted a Yuk Yuk's Comedy night with all proceeds going to Main Street Community Services on June 5th, 2015! It was a night of laughter, crying, and audience participation! Starting off the night was some musical entertainment provided by Jumpin' Jimmy Leroux, followed by opening comedy act Shannon Laverty, and the feature stand up comedian Mike MacDonald. A lucky member of the audience won a cash prize from the 50/50 draw held on site during intermission. Thank you to everyone who helped make this event a success: all the volunteers, Hurley's Bar and Grill, the entertainment, and everyone who came out to have a laugh! On May 9th, 2015 the Irish Hills Golf and Country Club hosted Main Street's Spring Fling! Entertainment for the night featured Gail Gavan, Ransom, Mike Ryan, Jeff and Jamie McMunn, Triple Trouble Dancers, and Colt 45 DJ Colton Craig. Special thanks goes out to Clark Premiere Properties, Wanada Clark for organizing this exciting and musical event! Thanks also goes out to all those who came out and supported Main Street Community Services, those who donated to the Silent Auction as well as purchased from the Auction and Raffle! First Annual Bubble Soccer Tournament! On November 15th, 2014, Main Street Community Services, in partnership with Bubble Soccer Ottawa and the Oz Dome, hosted our first annual Bubble Soccer Tournament. Bubble soccer is the newest craze in sports! It's fun, carefree, and quickly spreading worldwide. MSCS is extremely grateful to have had the opportunity to participate in this terrific event to raise money for the individuals in our care. Main Street Community Services would like to extend a special thanks to the Oz Dome for their gracious donation of playing time and to Bubble Soccer Ottawa for making this event happen! Special thanks also goes out to all those who came out to volunteer, play, donate prizes, and supported Main Street for this event!